The full title of this work is: My Gurudeva: a brief biography of Siddha Manohara Dasa Babaji by Navadvipa Dasa. This is a translation of a Bengali jivani on the life and teachings of one of the great siddhas of the 19th-20th centuries. The translation is complete and only waits for editorial attention. The part that has been edited so far is linked below. Hopefully this will be out in the first quarter of the next year (2011). Look for periodic updates. This project is nearly complete. The main text is done, but there is still more to do on texts included in the appendices. I decided to try to include translations of parts of some of Siddha Manohar Das Babaji's writings as a part of this publication. I have only been able to lay my hands on two of his three works. One is a short play on the lila of Mahaprabhu and the other is work on Radha-Krsna lila. Both are delightful. The third is called Sri Gopi-nama-ratna-mala and is said to be composed of the names of the gopis which when chanted or sung quickly leads to the rise of Krsna prema. I have had no success in tracing this work. Even Siddha Baba's ashram at Govinda-kunda has no copies. But, I bet there is someone out there who has a copy. If anyone, especially those who live in Vraja, comes across a copy, please send me a photocopy. That will complete our treatment of one of the most extraordinary Caitanya Vaisnavas of the 19th-20th century. I have begun working on this book again. The main part of the book, that part written by Navadvipa Das about his gurudeva is complete and in fairly good shape. It is the appendices that still require work. My original intention was to put samples of some of the writings of Siddha Manohara Das Babaji in the last three appendices. One of the books I wanted to include I have not been able to acquire. It is called Gopi-nama-ratna-mala, a sadhana developed by Siddha Baba for cultivating the feelings of love for Krsna felt by the Gopis. His reasoning is that in this Age of Kali the primary form of bhakti practice is nama-sankirtana and that therefore one should praise the names of the Gopis who love Krsna in order to focus on and gain love like theirs. It sounds fascinating. The Gopis are arranged on the yoga-pitha lotus with Radha and Krsna in the center, the first circle of Gopis closest to them are the manjaris headed by Rupa Manjari. Just outside of them are the eight main sakhis of Radha. Beyond them in the third circle of Gopis are more manjaris headed by Ananga Manjari (Radha's younger sister). Finally, there are in the outermost ring the four ladies of the forest headed by Vrndadevi. It would be great to have this work to see how Siddha Baba envisioned the practice. I have an image of this arrangement I will scan and post here. 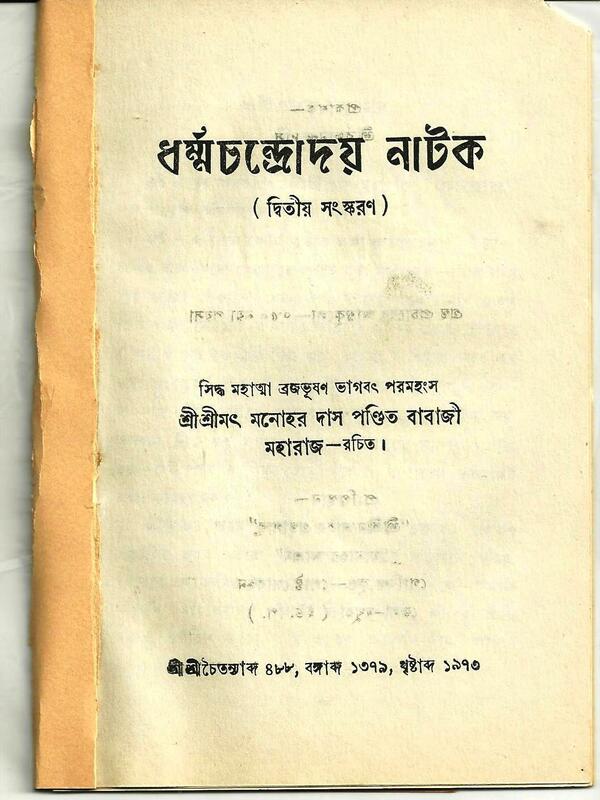 Karunamayi Dasji found and photographed an old copy of another of Siddha Baba's works called Dharma-candrodaya Nataka, the Rise of Moon of Dharma, a play in Bengali on the birth of Mahaprabhu. That will be translated in the last appendix. If anyone has a copy of the Gopi-nama-ratna-mala, please scan it or photograph it and send it to me by email. That would be great. Is anyone able to check with the Vrindavan Research Institute to see if by chance they have a copy? Baba's ashram in Govindakund no longer has any copies of the book. The last copies were destroyed in a flood some years back. I will keep everyone posted on my progress on this translation. Here is a photograph of the first page of Siddha Manohara Das Babaji's short play I will post more pages in the next few days. Hi, Nitai! happy to see all the recent news about the press here, especially this one. I'll make sure to get a copy of the Ujjvala sara sangraha as soon as i can, thank you for the sample you uploaded on the other thread, the introduction and notes on the verses are very clear and helpful, the cover is great as usual, i'm hopeful it will be very much appreciated by many. Thanks for your kind comment, Ed. I hope you enjoy the book when you get it. We got the first print copies today and it looks good. I am sending copies out to friend scholars for review and comments. I hope that by the time the book is released, it will be even better, its flaws fixed if possible and it strengths reinforced. The full text with all the available commentaries will be coming out in the summer or fall, small segments at a time. That seems to be all I can handle reliably these days. So, first volume: Krsna and His Friends (first two chapters of the Ujjvala). In the meantime, this book on Siddha Manahara Das Babaji will finally be released. Thank you, Nitai, i was wondering if perhaps you or another member here could comment about that ninth name (mukundānandanandanaḥ - Child of Mukunda’s joy)? Good question, Ed. I am not sure myself. My assumption is that Hadai Pandita's given name was Mukunda, but I have no evidence for that. I assume the author of the stotra, Siddha Manohara Das Babaji (? ), had info we don't. Hadai Pandita is not a proper name. It is more of what is called a "dak nam" in Bengali culture, basically a nick name like Nitai. What Hadai is based on is not clear. It could refer to one who hurries or is a rapid talker. There is a text on Nityananda's family that might provide support for the idea that Nitai's father was named Mukunda. Unfortunately, I don't have it and none of my sources have much info about Hadai Pandita. Another couple of chants from Siddha Manohara Dasa Babaji's Manifestations of Cleverness. Both should be recognizable. Kṛṣṇa Kṛṣṇa Kṛṣṇa Kṛṣṇa Kṛṣṇa Kṛṣṇa Kṛṣṇa, hey! Kṛṣṇa Kṛṣṇa Kṛṣṇa Kṛṣṇa Kṛṣṇa Kṛṣṇa, save me! Kṛṣṇa Kṛṣṇa Kṛṣṇa Kṛṣṇa Kṛṣṇa Kṛṣṇa, protect me! Gaura Gaura Gaura Gaura Gaura Gaura Gaura, hey! Gaura Gaura Gaura Gaura Gaura Gaura, save me! Gaura Gaura Gaura Gaura Gaura Gaura, protect me! Try kirtana or japa with these. Sukumar Sen: Bangala Sahityer Itihas [(1991], vol. 1, en bengalí. Calcuta: Ananda Publishers, 2007. ISBN 81-7066-966-9, pág. 293. I remembered your translation of Sadhana Bhakti Candrika here, they're in the section of early morning prayers, recently I saw these in a little book on sadacara compiled by a disciple of Sri Premgopal Goswami, in it a similar one is dedicated to Sri Radha as well. I haven't tried doing Kirtan of these later in the day, not sure why, but i will now. I'm looking forward to more excerpts from this book, thank you. Thanks, Ed, for the info. The Spanish Wiki seems better informed than the English one on Nityananda. I scoured the book on archive.org without finding any reference to Nityananda's parents. That edition, however, is the 1940 edition, not the 1991 edition. It might be that the later edition has been updated or revised by someone. Sukumar Sen has long left the planet. So I am not sure who revised the more recent text. Anyway, in the course of searching for a reference to Mukunda as the father of Nityananda I found it in a short text edited by Sundarananda Das called Sri Vaisnavabhadhanam by Devakinandana Kaviraja. Luckily I picked up whatever I could find of Sundarananda Das's works years ago when I was in Kolkata and today it pays off. Sundarananda Das was known as Sundarananda Vidyavinode in the Gaudiya Math. After 1950 or so he left along with Puridas and found proper initiation at the feet of Kanupriya Goswami Prabhupada. He later wrote and published a number of great works on various Caitanyite topics, one of which is the work of Devakinandana Kaviraja. The works he wrote while he was still in GM were pretty learned, too. I have several of those (thanks to my friends). I will put the relevant verse up in the next post. Of further interest is the fact that Devakinandana did a Bengali version of his Sanskrit work called Sri Vaisnava-vandana. In that work, for Nityananda's parents he says, "vando padmavati devi hadai pandit, yar putra nityananda adbhutacarita." Mukunda was Hadai Pandit's Sanskrit or given name. So who was Devakinandana Das? He was a disciple of Purusottama Thakur, who was a companion of Nityananda. This much we know for sure. Apart from that, through tradition and research, we know that before he became a disciple of Purusottama his name was Capal Gopala, a brahmana and teacher living in Navadvipa. He committed an offense against Srivasa and as a result became infected with leprosy. When Srivasa forgave him, he developed bhakti by the grace of Mahaprabhu. He wrote his two books, Vaisnava-vandana and Vaisnavabhidhana in order to prevent offenses to the members of the Vaisnava community. Such a leper is mentioned in Murari Gupta's Kadaca (2.13.6-17) and in Kavi Karnapura's Sri Caitanya-caritamrta-mahakavya (8.1-10). Krsnadasa Kaviraja also mentions him in the Cc (1.17) and calls him Gopala Capal. This seems to be our man, Devakinandana Das or Kaviraja.